Awaiting the arrival of my new computer today, I thought I'd mess around on Amanda's "work" computer and see if can start to figure out how these new programs work. 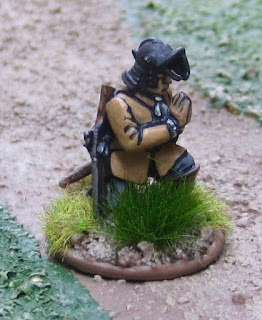 I've been working on a few more items for my Pikeman's Lament forces for the English Civil War. A Devout Cavalryman from The Assault Group. A unit of English Shot - these are a mix of figures from Old Glory, Wargames Foundry, Dixon Miniatures, and a few of my own home-cast figures. 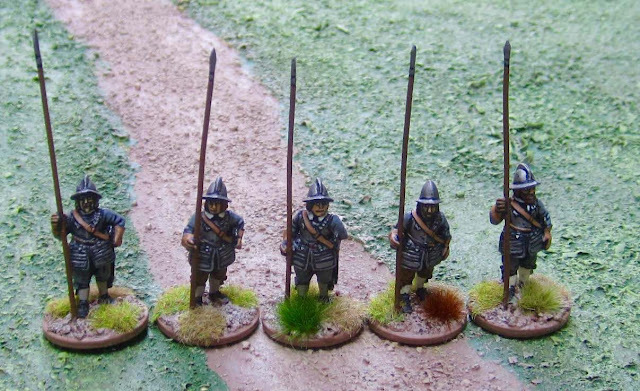 Four rather well armoured scotsmen from Wargames Foundry (They were actually English figures - that I've painted in hoden grey to use as Scotsmen. I didn't want to buy a pack of Scotsmen as I didn't need six guys in bonnets... but I figured I could pass armoured Englishmen off as Scots if I painted them in grey....). The entire Scots government English Civil War force so far. Two units of Shot, two units of Pike, a light frame gun and a unit of dismounted cavalrymen (fielded as a Forlorn Hope). 26 points so far - which could be modified by upgrading or downgrading any of the units. I also have two units of Scots Horse to paint up and then this will be complete - well as complete as it's going to be for the foreseeable future. 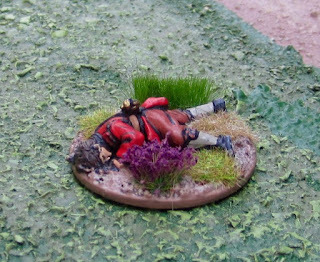 Redoubt Miniatures does have some Scottish Civilians I might pick up as some point to act as camp followers - which could be fielded as "Clubmen". I have about half of the Jet Bikes assembled - hopefully have some pics of finished ones shortly. I've also been working on some figures that finally arrived from Mike Bravo Miniatures (bit of an ordeal there...) They'll probably be the next things pictured on the blog. I also have the aforementioned Scots Horse on the workbench (it IS getting rather cluttered!). Progress on these has been slowed by the fact that I have been getting out for more bike rides and will be further slowed as I have a bit of prep work to do (mostly cleaning and organizing - and later DEMOLITION!) as we get ready for our kitchen renovation now scheduled for the end of the summer. Your ECW project is shaping up nicely! 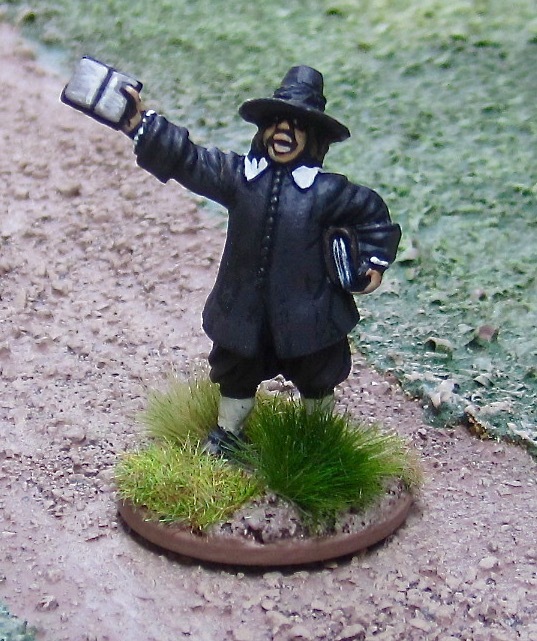 I have painted and fielded many of Redoubt's Bible Thumpers. Nice figure! There are rules for adding priests and rabble-rousers to units, but I haven't tried it out. Only a point and gives the unit a +1 to all morale tests... but any enemy that slays the special character gets a bonus victory point... so I'm not sure it's worth it. I operate by a corollary to your motto: "If is not at least fun or interesting, find something else to do." I really like your kneeling-in-prayer cavalryman. Great figure! I could use a few of these fine lads. "when have I ever cared if something was "worth it" - it sounds like fun"
That's usually my motto, too. Looks like you have some great pike and shot forces shaping up there! I took a break from my dwarf musketeers, but I have more prepped and ready for paint when I am ready to get to them. Looking forward to seeing some more of those Dwarf Musketeers! Very nice mate. I've not seen the Devout Cavalryman from The Assault Group before. A lovely miniature! Thanks Millsy! The Devout Cavalryman is one of their Freebie Specials that you can request if you order a certain amount of stuff (it used to be £39, I think...?). Those are nice! The preacher and praying cavalryman are full of character. Great figures! Warlord do some nice "rabble rousers", which include a Leveller; very useful. Thanks Monty! I've seen those "rabble rousers" - they do look fun and I had picked up a bunch of the Warlord Clubmen. I've often though about picking them up... but so far I've talked myself out of them with my standard "do I really NEED them...?" (not that NEED really has anything to do with the hobby... but, y'know, relatively speaking...). Nice bunch of ECW types, I'm basing my English ECW army on pennies and then sabot basing them. Trouble is my Scots are already on big bases, not. ..rebasing (the horror! ) preacher looks great, be interested to see him on a horse!